It is with great enthusiasm, that this event brings TAC members, friends, & fellow archers together for some much enjoyed Traditional Archery! 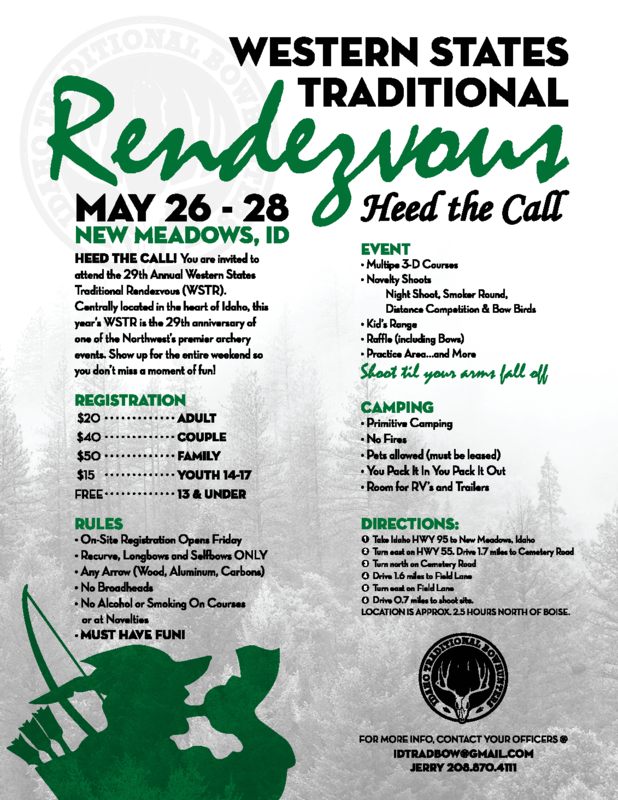 Many clubs have what seems like a steady stream of Novelty shoots, though Traditional Archers of CA limits their get togethers..we are ecstatic to once again be the hosts of “Western States Traditional Rendezvous”! This event draws folks from near & far: WA, OR, ID, & CA are the official hosts but our friends have arrived with bow in hand, from out of the US as well as East Coast & everything in between. TAC consists of members throughout CA as well as many out of state archers. It is mandatory that we look upon EVERYONE ..for support. Support comes in many ways: Financial, Physical, Raffle Donations, Cooked & Baked items, Range set-up / take-down, Food servers, Dish washers, Registration assistance, Novelty Assistance, Vendors..etc.. We open our home, fields, shop, practice areas, re-arrange the cattle for a week…all so you, your family & friends can come for an extended week / weekend of outdoor activities. If you can come in early to camp – GREAT! You can be put to work! We have something for everyone, if you have a special talent, hobby, skills, craft..Perfect! That is how raffle items are gathered & donated. During WSTR…we additionally provide a children’s raffle. Especially if you have children, Please consider offering a donation, you of all people know what your kid enjoys. And those with a generous heart & Love to see our kiddos out here, having the time of their life. We look forward to seeing everyone, working together, talking Story, enjoying the stars & moon..and all else Mother Nature has to offer! This entry was posted in 2018 - 05 May. Bookmark the permalink.